American Express is committed to the communities where its employees and customers live and work. 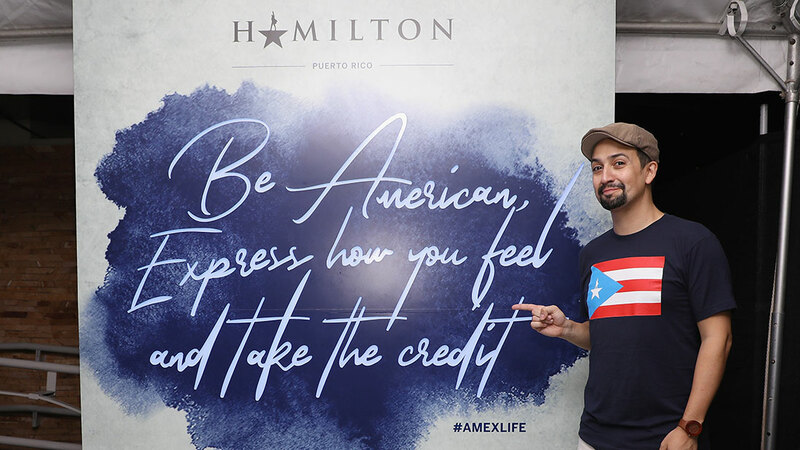 The company is proud to back global brand ambassador, Lin-Manuel Miranda, as he reprises his role of Alexander Hamilton in a special, limited-run of the award-winning musical Hamilton in San Juan, Puerto Rico, all in support of the arts. Lin-Manuel has committed to donating proceeds from the production and its partnerships to the Flamboyan Arts Fund, in partnership with the Flamboyan Foundation. Dine Small: To celebrate the opening weekend, American Express partnered with American Express Global Dining Collection chef José Andrés to host a Dine Small dinner for Card Members, as part of the Puerto Rico travel experience package. Chef Andrés and his organization World Central Kitchen served more than 3.7 million meals following Hurricane Maria in 2017. Chef Andrés curated this pre-show dinner experience with Puerto Rican chef Mario Pagán and several other local Puerto Rican chefs. Shop Small: During the weekend, American Express Card Members and local shoppers visited various small businesses and could enjoy giveaways and local treats from Shop Small street teams in the areas of Condado and Hato Rey. Small Business Saturday: In 2018, American Express expanded its Small Business Saturday support to the island, in partnership with many local organizations, encouraging people to get out and Shop and Dine Small in their communities. Nearly 100 small businesses engaged in the day and celebrated with special events. Shop Small Offer: American Express is continuing to support local businesses in Puerto Rico by providing eligible Card Members in Puerto Rico with a “Spend $10, Get $10” in-store offer at retail and dining small businesses in the San Juan Metro Area, from January 11 – February 28, 2019. Card Members must enroll their card and shop in-store at participating retailers, which can be found on the Puerto Rico Shop Small map. To continue to drive prosperity for the Puerto Rican economy, American Express is committing $250,000 to the Hispanic Federation, who works with both the private and public sectors to create jobs, rebuild the economy and promote sustainable small business growth throughout the island. Jimmy Fallon announced this on a special “Tonight Show” episode taped in Puerto Rico with Lin-Manuel, Chef Andrés and other amazing guests, airing on January 15, 2019. This contribution is in addition to the $1 million that American Express donated in the fall of 2017 to assist with immediate relief efforts, including shelter and food, for hurricane victims in areas including Puerto Rico, the Caribbean islands and the mainland U.S. And in 2018, American Express committed $300,000 to the American Red Cross to assist with the immediate needs, including shelter and food, of Hurricane Florence and Hurricane Michael victims.